Our compact AMAGNO Basic Training with a practical emphasis is based on proven and proven training concepts. Whether on-site at your company or our modern training centre in Oldenburg – we need just one day to introduce your employees to our pioneering Enterprise Content Management solution, granting them real professional achievement and ensuring a high acceptance rate for the transformation process. AMAGNO Advanced Training is designed with key users in mind and is also a high-impact short course which takes full advantage of the intuitive nature of the AMAGNO client. Key users can reinforce the knowledge they develop from the Basic Training and consolidate themselves as essential contact persons in the company. At our training centre or on site at your company. Training with a practical focus and tailored to your needs if required. Multi-level training concept for users and administrators. The ultimate goal of our specially designed training is to prepare your employees for an effective move over to the innovative AMAGNO Enterprise Content Management system. By helping your employees familiarise themselves quickly with topics such as document management, workflows, digital magnets and legally-compliant archiving, we ensure quick success in the implementation phase which results in high acceptance rates among employees. You can decide whether to send your employees to our modern training centre in Oldenburg or to have the training conducted directly at your location for an additional charge. Training consists of eight lesson units, each 45 minutes in duration and takes place on weekdays from 9 a.m. to 12 p.m. and from 1 p.m. to 4 p.m. Training can be done on your own hardware with a training environment (VM) from AMAGNO. 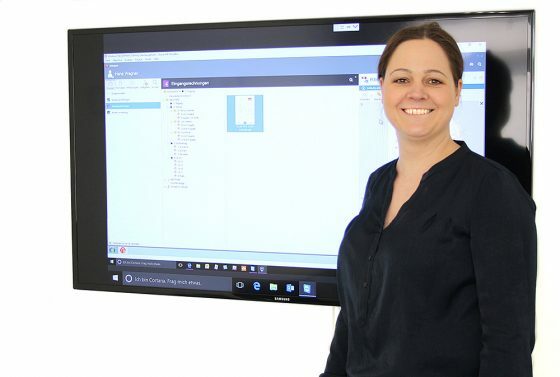 AMAGNO Basic Training participants will be able to get to know the basic software functions of the AMAGNO Enterprise Content Management solution. Your employees will learn how to successfully import, research, examine, edit, version and add comments to files in the AMAGNO system, as well as many other of its time-saving features. Participants will also learn how to use magnets and stamps in workflows and learn how to add metadata to documents. AMAGNO Advanced Training participants will learn how to set up document storage areas (Groups) in the AMAGNO ECM and assign member authorisations in the individual document storage areas (Vaults). They will learn how to import and export files along with metadata. as well as how to create magnets and stamps for the workflows and how to create fields for the entry of metadata for files. Advanced participants also learn how to configure the AMAGNO client i.e. the presettings, import and export settings, input support and notifications.